The start was frantic as always, even with less than 40 athletes in the pro wave. After a few bumps things sorted themselves out and I was following feet, pleased with the first few hundred metres. But it wasn’t long before a small group started gapping the rest of us and all of a sudden there was a 10m gap. I wanted to be with that group and put in a hard effort to make up the distance, but they weren’t coming back to me. I quickly decided to ease back into a more comfortable pace and forget about what was going on ahead. I was at the front of the chase group until about halfway, where I started swimming alongside Chris Goodfellow. He’s a good swimmer, so that gave me confidence that things were going well. I turned to see that the group were right on our feet, so at this point I slowed and let some of the group come to the front. This gave me the chance to sit on feet and have an easier ride for a while. With about 1km to go I started thinking about transition. I knew it would be hectic with all the pros trying to grab their transition bags from the same space on the rack – the only way to avoid the congestion would be to get to transition first. With around 300m to go I took a wide line to the final turn buoy and upped the effort. It wasn’t all out –enough to get myself a 10 second gap coming out of the water – but importantly, it meant I had a clear run through transition. I didn’t realise it at the time, but this was a decision that would dictate the rest of my race. I was 8th out the water with a 90 second swim PB of 52:46. As soon as the bike leg started I was passed by two guys who immediately pulled away into the distance. I turned around and couldn’t see anyone behind. The race was happening up ahead and I wanted to be in it. I put my head down and pushed above race pace to catch the two ahead. It took about 20 minutes, but eventually I latched on. I sat 3rd wheel for a while, but the pace was feeling easy, too easy for the initial stages of the bike. The leader started adjusting his shoes and I went to the front and pushed until we had the lead group in sight. I couldn’t believe it – 30 minutes in and we could already see the guys who put over a minute into us on the swim. It took us another 15 minutes to catch them, but catch them we did. We took over 2 minutes out of them in the first 30km – a combination of us riding hard and perhaps them riding easy. Once our groups came together there were now around 8 of us, which soon became more as riders behind also caught us up. At one stage I counted and I was sitting 10th wheel – this group was big! We had 2 draft marshals with us for most of the ride making sure that we were staying the legal distance. It seemed pretty clean and I didn’t see any penalties given out. There was at least one guy ahead (maybe two), but I wasn’t going to be the one to set the pace. The strategy was to sit back and see how things play out – not to do anything stupid. There were a few attacks from the front of the group and all of a sudden you had to push really hard to keep up. I was confident in my ability to ride with the guys around me, so I wasn’t about to let any of them break away. This was turning out to be my most enjoyable Ironman ride, purely because of the tactics involved in being in the pro race. You have to be mentally alert all the time to make sure you’re seeing what’s happening around you – are people struggling, are they starting to leave gaps to the rider ahead, are they fidgeting on the bike… there are so many things to think about. Meanwhile, I was executing a reworked nutrition strategy following testing in the lab with High 5. Everything was going to plan. At around 130km there was a serious attack from the front, which I was slow to see. The guy in front of me hadn’t responded and we were falling behind. Again, I had to put in a big effort to catch back up to the group and when I did, there was nobody else behind me. A group of 10+ was now 5 and we were headed for home. The pace seemed to be reasonable until the final 10km or so where it seemed to really slow down. I seriously considered moving to the front, but thought better of it with Brian’s pre-race words echoing in my mind. We came into transition with 5:26 on the clock having ridden 4:31:05. T2 was slow – I knew it would be. I had a bottle with High 5 Energy Source (caffeinated) which I started with – again, all part of the nutrition plan. I came out of transition trailing, but feeling confident in the run ahead. I opened with a 6 minute mile, hoping to see some of the others ahead. I saw Kiwi Keegan Williams and within another mile caught him. Going out hard for the first 2 miles was another decision that impacted my race hugely. We chatted briefly and decided to take turns to set the pace. We worked well together, reeling in a couple of guys ahead pretty quickly. Conditions were overcast and cool - perfect for fast running. I looked at my watch as we passed the halfway mark – 1:24:53. I thought that if my running legs showed up, a 2:56 would be possible, but I’d have to run really well to do it. This was much faster than I planned to run, so I hoped I wasn’t going to end up regretting the early pace. The crowd support had been amazing all day, but there was one moment at halfway where the cheers were so loud it was unreal. I closed my eyes briefly and told myself to take their energy with me. This seemed to give me a second wind and I ran 13 through 20 miles really strongly, averaging <6:30/mile. During this stage Keegan fell back and I was running solo, which in a way was disappointing as Keegan had helped me maintain a decent pace. There was one turn around point on the course where you could see the gap to those ahead, but the guy ahead had a few minutes on me. At mile 20 my second wind had disappeared and I started to slow. I wasn’t bonking, but 6:30 became 6:35, then 6:40, which led to my slowest mile of the race, a 6:45 at mile 23. At this stage the end was in sight and I found a little extra for the next couple of miles. The final mile was incredible, running past the crowds, knowing the finish was so close. With 200m to go I glanced at my watch and realised there was a chance of a sub-2:50 run if I went for it. 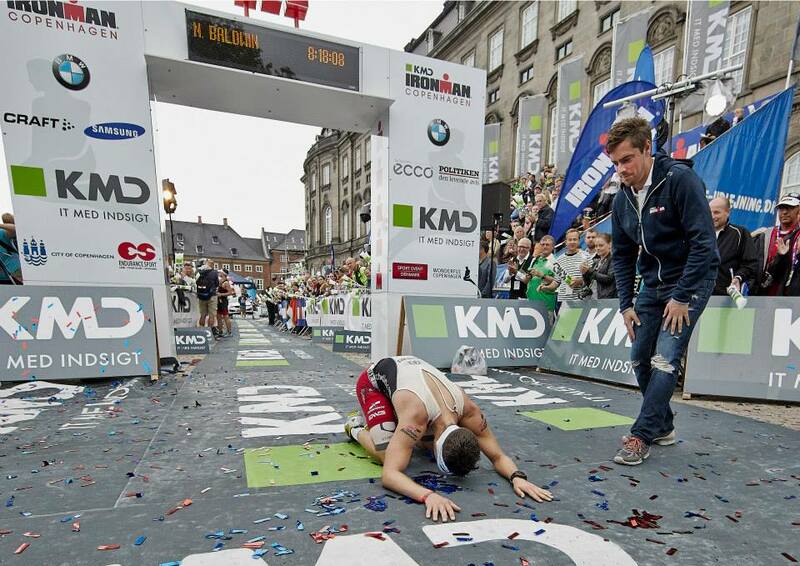 I gave it everything coming down the finish chute and saw 8:18 on the clock – you have to be kidding me! 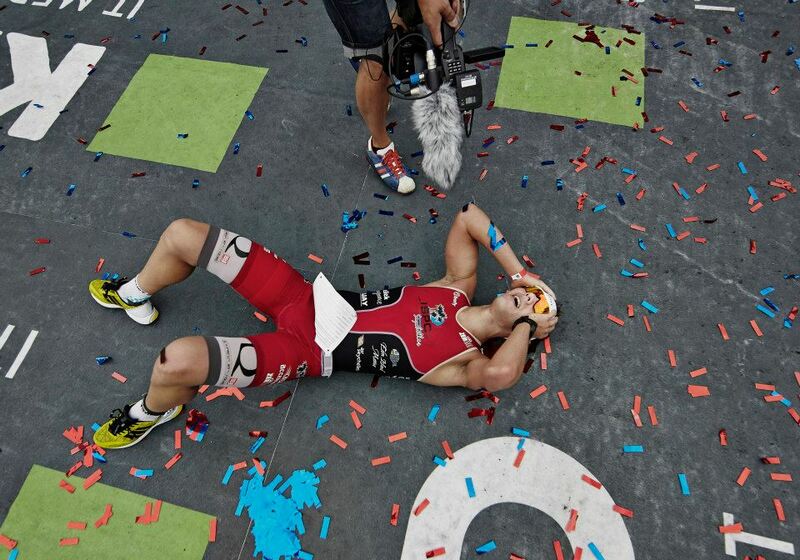 I was so pumped as I crossed the line, but within seconds found myself on the floor. Once on my feet again I went back down the finishing chute to thank the crowd, revelling in the incredible finish line atmosphere. I ended up with seconds to spare for a 2:49:57 run split (the second half just 11 seconds slower than the first half) and a finish time of 8:18:08. I wasn’t sure whether I’d finished in 3rd or 4th, so when I heard 4th there was a brief moment of disappointment. It was only the briefest moment though, as I couldn’t have made up the 90 seconds to 3rd. I'd given my all and couldn't have been happier. There were two elements on the day that enabled me to have a good race – the first of which was making some good tactical decisions. Secondly, executing an adapted pre-planned nutrition strategy set me up for a breakthrough run. Most races come down to the run, so beating my previous PB of 3:03:58 by 14 minutes is a big step in the right direction. I’ve never considered myself a runner, but now I have the confidence that my run can get me close to the pointy end of the field.